G protein-coupled receptors (GPCRs) are a family of proteins containing seven transmembrane helices, with the N- and C-terminus of the protein located at the extracellular space and cytosol, respectively. Here, we report that ceramide or related sphingolipids might invert the topology of many GPCRs that contain a GXXXN motif in their first transmembrane helix. The functional significance of this topological regulation is illustrated by the CCR5 chemokine receptor. In the absence of lipopolysaccharide (LPS), CCR5 adopts a topology consistent with that of GPCR, allowing mouse peritoneal macrophages to migrate toward its ligand CCL5. LPS stimulation results in increased production of dihydroceramide, which inverts the topology of CCR5, preventing macrophages from migrating toward CCL5. These results suggest that GPCRs may not always adopt the same topology and can be regulated through topological inversion. Editorial note: This article has been through an editorial process in which the authors decide how to respond to the issues raised during peer review. The Reviewing Editor's assessment is that major issues remain unresolved (see decision letter). G protein-coupled receptors (GPCRs) are a family of proteins containing seven transmembrane helices that are crucial for cell signaling (Rosenbaum et al., 2009). A common feature of GPCRs is that their N-terminus is extracellular, which means that during synthesis their N-terminal end is inserted into lumen of the endoplasmic reticulum (ER) (Rosenbaum et al., 2009). However, the vast majority of GPCRs do not contain an N-terminal cleavable signal peptide (Guan et al., 1992), the well-characterized mechanism directing N-terminus of most secretory and transmembrane proteins into ER lumen (Zimmermann et al., 2011). The difference in charge between the cytosolic and luminal loops surrounding the first transmembrane helix as well as the hydrophobicity of the first transmembrane helix of some GPCRs was reported to be crucial for translocation of their N-terminus into ER lumen (Harley and Tipper, 1996; Wahlberg and Spiess, 1997). However, these mechanisms are unlikely to be the only ones allowing GPCRs to be inserted into membranes with such an orientation. We have recently analyzed the topology of a transmembrane protein called TM4SF20 (transmembrane 4 L6 family member 20). Similar to GPCRs, the N-terminus of TM4SF20 is inserted into ER lumen in the absence of a functional signal peptide (Chen et al., 2016). We revealed that a GXXXN motif in the first transmembrane helix of TM4SF20 was crucial to adopt such a topology, as mutating either the glycine or asparagine residue within the motif reversed the topology of the protein by exposing the N-terminus to cytosol (Chen et al., 2016). Remarkably, the topology of TM4SF20 is inverted by ceramide or related sphingolipids as the lipid alters the direction through which the first transmembrane helix is translocated across membranes (Chen et al., 2016). Since this regulatory mechanism does not flip transmembrane proteins that have already been synthesized but inverts the topology of newly synthesized proteins by changing the direction through which transmembrane helices are translocated across membranes, we designated this process as Regulated Alternative Translocation (RAT) (Chen et al., 2016). This process depends on the GXXXN motif, as destruction of the motif locked the protein into the inverted topology regardless of ceramide treatments (Chen et al., 2016). In the current study, we show that the GXXXN motif is also present in many GPCRs. We further demonstrate that topology of CCR5 (CC chemokine receptor type 5), one of the GPCRs containing this motif, is inverted through RAT in lipopolysaccharides (LPS)-stimulated macrophages. These results suggest that functions of GPCRs may be regulated by topological inversion through RAT. To search for other proteins that may undergo RAT, we performed a bioinformatics analysis to identify proteins that contain a GXXXN motif in their first transmembrane helix. This analysis revealed that ~100 transmembrane proteins, most of which are GPCRs, met our searching criteria (Table 1—source data 1). Interestingly, this list contains 13 of the 16 known CC and CXC chemokine receptors (Table 1), which are GPCRs that direct migration of leukocytes and lymphocytes toward their chemokine ligands (Horuk, 2001). We selected CCR5 for characterization, as its physiological functions as a chemokine receptor and pathological function as a co-receptor for human immunodeficiency virus (HIV) have been well characterized (Lederman et al., 2006). To determine whether ceramide induces the predicted topological inversion (Figure 1A), we fused a SNAP-tag, which can be covalently attached to a benzylguanine-derived fluorophore (Keppler et al., 2003), at the C-terminus of CCR5. Under normal circumstances, the C-terminus of CCR5 is in the cytosol (designated as orientation CCR5(A)) (Rosenbaum et al., 2009), making the SNAP-tag inaccessible to a cell-impermeable labeling reagent. If ceramide triggers RAT of CCR5 and the protein with the inverted topology still reaches plasma membranes, then the C-terminus of CCR5 with an inverted topology (designated as CCR5(B)) is extracellular so that the SNAP-tag should be labeled by the cell-impermeable reagent. To control for variable protein expression, we normalized the fluorescent signal generated from the cell-impermeable reagent against that generated from a cell-permeable reagent, which labels the SNAP-tag regardless of its localization. Treatment with C6-ceramide, a cell permeable analogue of ceramide that is metabolically converted to natural ceramide inside cells (Denard et al., 2012), increased this normalized value by ~70 fold in cells expressing SNAP-tag-fused CCR5 (Figure 1B). C6-ceramide also increased this normalized value by 10- to 150-fold in cells expressing SNAP-tag-fused CCR1, CCR4, CCR10 and MAS1, all of which contain the GXXXN motif (Table 1). In contrast, C6-ceramide did not enhance this value in cells expressing the SNAP-tag-fused β2- adrenergic receptor (β2AR), which does not contain this motif (Figure 1B). These results are consistent with the hypothesis that ceramide shifts the C-terminus of those GPCRs that contain the GXXXN motif from the cytosol to extracellular space. They also demonstrate that at least some of these GPCRs with the inverted topology reach the cell surface. Ceramide alters localization of C-terminus of GPCRs containing the GXXXN motif. (A) Schematic illustration of topological inversion of C-terminally tagged GPCRs. (B) HEK-293 cells transfected with a plasmid encoding the indicated GPCR fused with a SNAP-tag at the C-terminus were treated with 8 μM C6-ceramide for 16 hr, and labeled with a cell permeable or impermeable SNAP-tag substrate. The ratio of fluorescent signal generated from cell impermeable versus that from cell permeable substrate was reported, with the value from cells untreated with C6-ceramide set at 1. Results were reported as Mean ±S.E. from triplicate incubations of a typical experiment. Similar results were obtained from two other independent experiments. 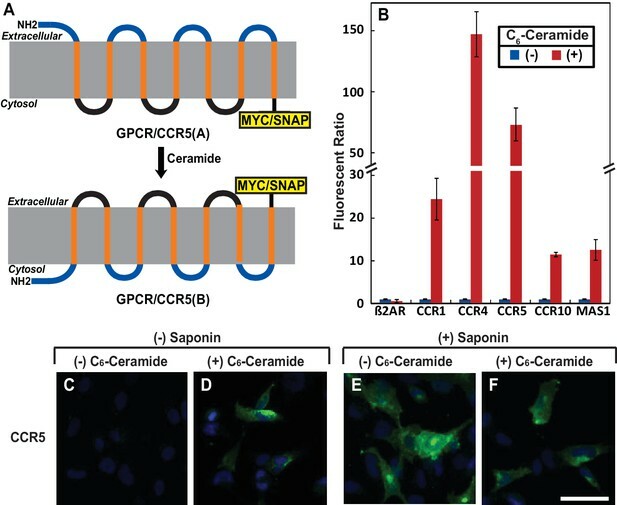 (C–F) SV589 cells transfected with pCCR5-Myc were treated with C6-ceramide as described in B, and subjected to immunofluorescent microscopy analysis with anti-Myc in the absence (C, D) or presence (E, F) of saponin-mediated cell permeabilization. Scale bar = 50 μm. GXXXN motif presented in the first transmembrane helix of selected GPCRs. The GXXXN motif present in the first transmembrane helix of human TM4SF20, chemokine receptors and MAS1 is highlighted. The amino acid numbers of the aligned residues are indicated. To further characterize the topological inversion of CCR5, we transfected cells with a plasmid encoding C-terminally Myc-tagged CCR5 and performed immunofluorescent microscopy with anti-Myc in the absence of saponin-mediated cell permeabilization followed by immunofluorescent microscopy analysis. This condition can detect CCR5 only if the C-terminal tag is extracellular but not if it is within the cytosol. The Myc-tag was undetectable in cells in the absence of ceramide, but was visible on cell surface in those treated with the lipid (Figure 1C and D). As a control, we performed the same analysis in cells permeabilized by saponin. CCR5 was readily detectable primarily on cell surface regardless of the ceramide treatment under this condition (Figure 1E and F). In the absence of saponin, ceramide did not increase the immunofluorescent signal by inducing cell permeabilization, as treatment with the lipid under this condition did not enable detection of Giantin, a Golgi marker (Linstedt and Hauri, 1993) (Figure 1—figure supplement 1). These results are consistent with the hypothesis that ceramide inverts the topology of CCR5. We then determined whether ceramide altered localization of the N-terminus of CCR5. In CCR5 produced under normal circumstance (CCR5(A)), this extracellular region (Duma et al., 2007) contains four O-linked glycosylation sites (S6, S7, T16, S17), which are the only sites where CCR5 is glycosylated (Bannert et al., 2001). If ceramide induces RAT of CCR5, these sites should no longer be glycosylated as the N-terminal domain of CCR5 with the inverted topology (CCR5(B)) should be in cytosol (Figure 2A). Since the extracellular regions of CCR5(B) do not contain any consensus sites for glycosylation, the apparent molecular weight of CCR5(B) is expected to be lower than that of CCR5(A), because CCR5(B) should not be glycosylated (Figure 2A). Immunoblot analysis revealed that in the absence of ceramide, CCR5 migrated at the established molecular weight (Figure 2B, lane 1). Treatment with C6-ceramide gradually increased the amount of another form of the protein with a lower molecular weight (Figure 2B, lanes 2–6). Ceramide stimulates RAT of CCR5. (A) Schematic illustration of the effect of RAT on O-linked glycosylation of CCR5. (B) SV589 cells transfected with pCCR5-myc were treated with 8 μM C6-ceramide for the indicated time followed by immunoblot analysis with anti-Myc. (C) SV589 cells transfected with the indicated plasmid were treated with or without 8 μM C6-ceramide for 16 hr followed by immunoblot analysis with anti-myc. (D) HEK293 cells transfected with pSNAP-CCR5 were treated with 8 μM C6-ceramide for 16 hr, labeled with a cell-impermeable fluorescent substrate for SNAP-tag, and quantified the labeling reaction through a fluorimeter. Results are reported as mean ±S.E. from triplicate incubations of a typical experiment. (E) Schematic illustration of the effect of RAT on cell surface labeling of extracellular cysteine residues in wildtype and the topology reporter CCR5. (F and G) SV589 cells transfected with Myc-tagged wildtype or topology reporter CCR5 were treated with 8 μM C6-ceramide for 16 hr. After cell surface labeling of extracellular cysteine residues with biotin, cell lysates were precipitated with streptavidin beads. Equal fractions of whole cell lysate (W), pellet (P) and supernatant (S) were subjected to immunoblot analysis with anti-Myc. If the lower molecular weight of CCR5(B) is caused by the lack of glycosylation, then blocking glycosylation of CCR5(A) by mutating the four O-linked glycosylation sites should abolish the reduction in molecular weight observed above even if ceramide still induces RAT of CCR5. To test this hypothesis, we mutated all four glycosylation sites to alanine (S6A, S7A, T16A, and S17A). These mutations did not block ceramide-induced RAT of CCR5 judging by the localization of C-terminus of the protein using the assay shown in Figure 1 (Figure 2—figure supplement 1). The apparent molecular weight of the B form of the mutant CCR5 produced in ceramide-treated cells was the same as that of the A form produced in untreated cells (Figure 2C, lanes 3 and 4), and it was identical to that of wildtype CCR5(B), which was also unglycosylated (Figure 2C, lanes 2–4). We also used N-terminally SNAP-tagged CCR5 known to be active in ligand binding (Orlandi et al., 2016) to determine the localization of the N-terminus of the protein. Consistent with the model shown in Figure 2A, fluorescent labeling by a cell-impermeable reagent was detected in cells incubated in the absence of C6-ceramide but not those in the presence of the lipid (Figure 2D). Immunoblot analysis indicated that C6-ceramide treatment did not affect expression of the fusion protein (Figure 2—figure supplement 2). It should be pointed out that the N-terminally SNAP-tagged CCR5 used in these experiments contains a signal peptide derived from CD8 at the N-terminus. Our previous study demonstrates that addition of an N-terminal signal peptide does not affect ceramide-induced RAT of TM4SF20, a transmembrane protein containing the GXXXN motif in the first transmembrane helix (Chen et al., 2016). We then used an approach of cell surface cysteine labeling to determine whether ceramide inverts topology of CCR5. For this purpose, we generated a CCR5 topology reporter by mutating all five cysteine residues located at the intracellular side of CCR5(A) but leaving those located at the extracellular side intact. The reporter protein expressed in cells cultured in the absence of ceramide should be biotinylated by a cell surface sulfhydryl reactive biotinylation reagent thereby precipitable by streptavidin beads, as CCR5(A) of the reporter protein contains extracellular cysteine residues (Figure 2E). If ceramide inverts the topology of CCR5, then the reporter protein expressed in cells treated with ceramide is not expected to be biotinylated by the same reagent, as extracellular loops of the reporter CCR5(B) do not contain any cysteine residues (Figure 2E). To test this hypothesis, we incubated cells expressing the reporter CCR5 with a cell-impermeable sulfhydryl reactive biotinylation reagent, precipitated the biotinylated proteins by streptavidin-conjugated beads, and determined the amount of the reporter protein precipitated through immunoblot analysis. The reporter protein was precipitated by streptavidin-conjugated beads in the absence of C6-ceramide, an observation indicating that the mutations made in the reporter protein did not affect transport of the protein to cell surface (Figure 2F, lanes 3 and 5). In contrast, the reporter protein was not precipitated at all in cells treated with C6-ceramide (Figure 2F, lanes 4 and 6). As a control, we also performed the same experiment with wildtype CCR5, which contains cysteine residues on both sides of membranes (Figure 2G). Wildtype CCR5 was precipitated by streptavidin beads regardless of ceramide treatment (Figure 2G). These observations demonstrated that CCR5(B) produced in the presence of ceramide was also on the cell surface, ruling out the possibility that the result shown in Figure 2F was caused by ceramide-induced internalization of CCR5. We then investigated the physiological function of RAT of CCR5. LPS was reported to stimulate production of ceramide in mouse macrophage-like RAW264.7 cells (Sims et al., 2010). Unlike RAW264.7 cells, we observed that treatment of mouse peritoneal macrophages with LPS increased production of dihydroceramide but not ceramide (Figure 3A). Since dihydroceramide is structurally similar to ceramide and has been shown to perform functions previously attributed to ceramide (Siddique et al., 2015), we hypothesized that LPS-induced production of dihydroceramide may also induce RAT of CCR5. LPS induces RAT of CCR5 in primary mouse macrophages. (A–I) Mouse macrophages were treated with or without 100 ng/ml LPS in the absence (B–E) or presence of 30 μM FB1 (F–I) for 16 hr. (A) The amount of dihydroceramide with the indicated amide-linked acyl chains in the cells was determined through LC-MS measurement. Results are reported as mean ±S.E. from three independent experiments. 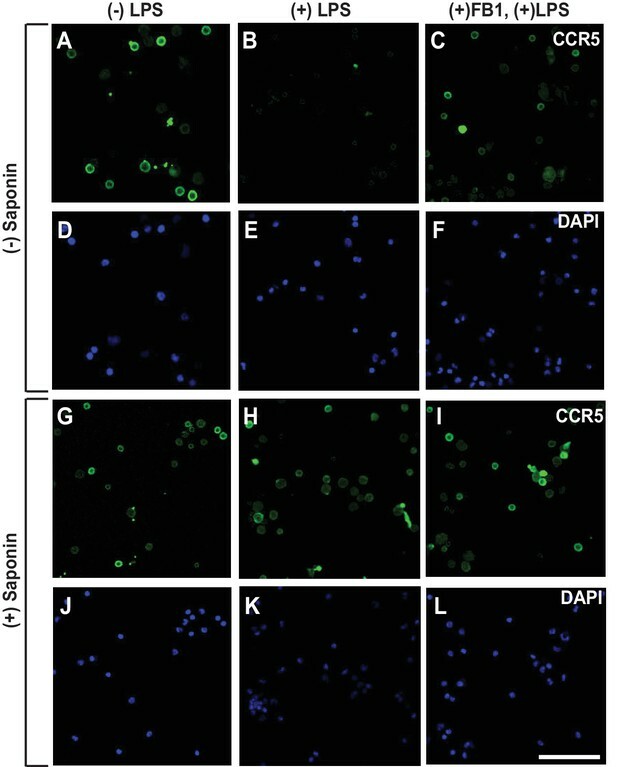 (B–I) Macrophages were subjected to immunofluorescent microscopy analysis with an antibody against the seoncd extracellular loop of CCR5(A) in the absence or presence of saponin-mediated cell permeabilization. Scale bar = 10 μm. (J and K) Macrophages treated without (J) or with (K) 100 ng/ml LPS for 24 hr were subjected to immuno-gold EM analysis with an antibody against the N-terminal domain of CCR5. Scale bar = 200 nm. (L) The number of intracellular and extracellular-localized CCR5 labeled by gold clusters per cell was quantified from macrophages treated with (n = 20) and without LPS (n = 28). The results are reported as mean ±S.D. This number should be smaller than that of CCR5 molecules, as it did not include CCR5 labeled by a single gold particle, the specificity of which was difficult to determine. To test this hypothesis, we used an antibody reacting against the second extracellular loop of CCR5(A) (Lee et al., 1999). This antibody recognizes a conformational epitope as it failed to detect CCR5 by immunoblot analysis but was active in identifying the protein through immunofluorescent microscopy. The immunofluorescent signal was specific to CCR5 as macrophages obtained from Ccr5-/- mice showed no such signal (Figure 3—figure supplement 1). We stained mouse peritoneal macrophages with this antibody in the absence of saponin-mediated cell permeabilization followed by immunofluorescent microscopy analysis. This condition can detect CCR5 only if the epitope was extracellular but not if it was within the cytosol. CCR5 was detected through this method in macrophages cultured in the absence but not in the presence of LPS (Figure 3B and C). As a control, we also performed the same analysis in permeabilized macrophages. CCR5 was readily detectable on cell surface regardless of the LPS treatment under this condition (Figure 3D and E, Figure 3—figure supplement 2 for images with properly adjusted intensity). To confirm that LPS stimulates RAT of CCR5 through increased production of dihydroceramide, we treated macrophages with fumonisin B1 (FB1), an inhibitor of ceramide synthase that catalyzes formation of the sphingolipid (Kitatani et al., 2008). Treatment with FB1 prevented LPS from inducing production of dihydroceramide (Figure 3A), and rendered the N-terminus of CCR5 to be detected by fluorescent microscopy regardless of treatment with LPS and cell permeabilization (Figure 3F–I). To further determine whether LPS inverts the topology of CCR5, we performed an immunogold electron microscopy (EM) analysis to determine the localization of the epitope localized at the second extracellular loop of CCR5(A). Gold clusters presumably generated by binding of multiple gold-conjugated secondary antibodies to anti-CCR5 are considered as CCR5-specific (Singer et al., 2001) as such signal was never observed in CCR5-/- macrophages. Some CCR5 was labeled by a single gold particle, as their number in wild type macrophages was higher than that in CCR5-/- macrophages. However, the specificity of such labeling was difficult to determine, as these particles did exist in CCR5-/- macrophages. For this reason, we only analyzed CCR5 labeled by gold clusters, the number of which should be smaller than that of CCR5 molecules. In the absence of LPS, the gold particle clusterswere found on extracellular side of plasma membranes (Figure 3J, Figure 3—figure supplement 3). These particles were found on intracellular side of plasma membranes but not endocytic vesicles in cells treated with LPS (Figure 3K, Figure 3—figure supplement 3). After counting ~20 macrophages cultured in either condition, we found that the vast majority of CCR5 labeled by gold clusters had its N-terminus at the extracellular and intracellular side of plasma membranes, respectively, in cells cultured in the absence and presence of LPS (Figure 3L). To rule out the possibility that the results shown above are artifacts of in vitro treatment with LPS, we injected LPS into mouse peritoneal cavity, and then isolated macrophages to determine the topology of CCR5. Since we did not treat the cells with LPS after their isolation, we analyzed the macrophages through immunofluorescent microscopy as soon as they stick to the culture plates. As a result, these cells appeared to be rounded, as they did not have time to spread out. Under this condition, LPS also induced RAT of CCR5 in macrophages, and this topological inversion was inhibited by co-injection of FB1 (Figure 4A–L). LPS injected intraperitoneally induces RAT of CCR5 in macrophages. Macrophages isolated from peritoneal cavity of mice injected intraperitoneally with 1 mg/kg LPS and 1 mg/kg FB1 for 16 hr were analyzed as described in Figure 3B–I. Scale bar = 20 μm. Since the N-terminal domain of CCR5 is in direct contact with chemokine ligands (Duma et al., 2007), LPS-induced topological inversion, which places this region into cytosol, should block the receptor from binding to the extracellular chemokine ligands thereby preventing macrophages from migrating toward these chemokine ligands. As expected, treatment with LPS completely blocked migration of macrophages toward CCL5 (Figure 5A), a known ligand for CCR5 (Samson et al., 1997). The migration observed in the absence of LPS was strictly dependent on CCR5, as such migration was not detected in Ccr5-/- macrophages (Figure 5A). RAT of CCR5 blocks migration of macrophages toward CCL5. (A) Migration of macrophages from mice with indicated genotype was assayed in transwell plates for 24 hr with or without 100 ng/ml LPS in the upper wells and 100 nM CCL5 as the chemoattractant in lower wells. Signals generated in the absence of CCL5 were subtracted to normalize for random migration. (B) Migration assays were performed as described in (A) with wildtype macrophages incubated with LPS and 30 μM FB1 in upper wells as indicated. (A and B) Results were reported as mean ±S.E. from three independent experiments, with the value obtained from untreated WT macrophages set at 100%. If LPS blocks migration of macrophages toward CCL5 by stimulating RAT of CCR5, then FB1, which prevents LPS from inducing RAT of CCR5 by inhibiting production of dihydroceramide (Figure 3F–I), should relieve this blockade. Indeed, co-treatment with FB1 eliminated the inhibitory effect of LPS on migration of macrophages toward CCL5 (Figure 5B). Figure 6 illustrates the speculative functions of RAT of CCR5. Upon bacterial infection, cells surrounding the infected tissue secrete chemokines including CCL5 (Horuk, 2001). 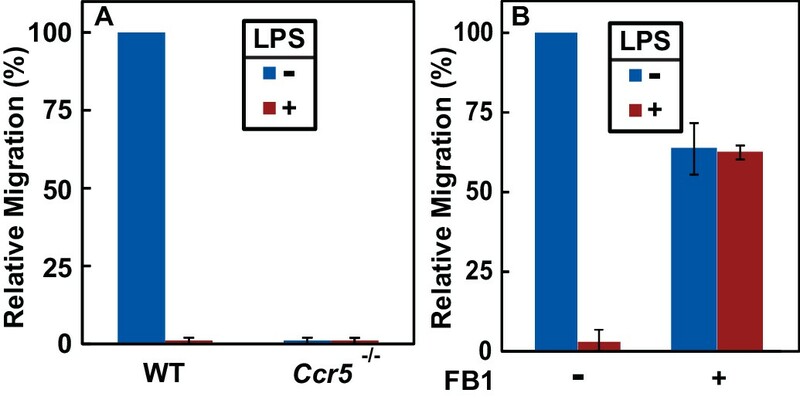 In unprimed macrophages, CCL5 interacts with the GPCR configuration of CCR5 (CCR5(A)), attracting migration of these cells toward the infected sites. Upon encounter with bacterial byproducts such as LPS, the increased production of dihydroceramide in macrophages triggers RAT of CCR5, resulting in production of the protein with an inverted topology (CCR5(B)). This topological inversion blocks macrophages from further migration toward CCL5, allowing macrophages to produce pro-inflammatory cytokines to combat infection at the current location instead of migrating to the cells from which CCL5 is secreted, as these cells themselves may not be infected. On the other hand, RAT of CCR5 and other CC and CXC families of chemokine receptors containing a GXXXN motif in their first transmembrane helix may explain why macrophages overwhelmed by LPS during sepsis are markedly less effective in clearing bacterial infection, as they may be less sensitive to chemotaxis reaction (Biswas and Lopez-Collazo, 2009). A speculative model illustrating LPS-induced topological inversion of CCR5 through RAT. Upon infection, cells surrounding the bacterial infected sites secret chemokines including CCL5. Through its interaction with CCR5 expressed in unprimed macrophages that adopts a topology consistent with that of a GPCR (CCR5(A)), CCL5 attracts migration of macrophages toward the infection site. Upon encounter with bacterial byproduct LPS, the increased production of dihydroceramide in macrophages causes RAT of CCR5, leading to expression of CCR5 with an inverted topology (CCR5(B)). This topological inversion prevents further migration of macrophages toward CCL5. In addition to CCR5, CXCR4, another chemokine receptor that has been identified as a co-receptor for HIV (Lederman et al., 2006), also contains the GXXXN motif in the first transmembrane helix, and therefore is likely subjected to topological regulation through RAT as well. Since HIV directly interacts with the N-terminal domain and the second extracellular loop of CCR5 and CXCR4 with a topology consistent with that of GPCRs (Dogo-Isonagie et al., 2012; Huang et al., 2007; Lu et al., 1997), topological inversion of these receptors through RAT should block HIV entry as the regions binding the virus should be located intracellularly thereby inaccessible to the virus in circulation. This notion is consistent with previous reports showing that LPS or other treatments increasing intracellular levels of ceramide led to resistance in HIV infection (Bernstein et al., 1991; Finnegan et al., 2004; Kornbluth et al., 1989). These observations suggest that compounds capable of inducing RAT of these chemokine receptors but without toxicity associated with LPS may be particularly effective in combating HIV infection, as the single treatment may block both receptors from supporting entry of HIV. The current study reveals that LPS-induced topological inversion of CCR5 may be one of the mechanisms for LPS to inhibit chemotaxis mediated by the receptor. This conclusion is supported by our observations that FB1, which blocked LPS-induced topological inversion of CCR5 by inhibiting synthesis of dihydroceramide, restored the chemotaxis reaction of macrophages exposed to LPS. Since most CC and CXC families of chemokine receptors contain a GXXXN motif in their first transmembrane helix, LPS may invert the topology of all these chemokine receptors. This scenario may explain why mice deficient in ceramide synthase 6, the major ceramide synthase expressed in macrophages, over-recruited macrophages to the inflammatory sites because of enhanced chemotaxis (Eberle et al., 2015), as the lack of production of dihydroceramide may not be able to inhibit these chemokine receptors through topological inversion. However, since CCR5 can be desensitized through other mechanism such as arrestin-mediated internalization (Oppermann, 2004), it remains unclear whether topological inversion through RAT is the only mechanism through which LPS inhibits CCR5 activity as a chemokine receptor. The best approach to test this hypothesis is to make a mutant CCR5 resisting dihydroceramide-induced RAT by locking the topology into CCR5(A). Unfortunately, fixing topology of CCR5 and TM4SF20, another protein subjected to RAT, into their A form appears to be challenging. TM4SF20 still underwent RAT when we fused a prolactin signal peptide at the N-terminus of the protein (Chen et al., 2016). Likewise, the N-terminally SNAP-tagged CCR5 construct used in the current study contains a signal peptide from human CD8, but the protein still underwent ceramide-induced RAT. Thus, understanding the molecular details of the regulatory mechanism behind RAT may be required before reagents can be developed to test this hypothesis. It should be pointed out that our data regarding inaccessibility of the antibodies against extracellular regions of CCR5(A) with the GPCR configuration in LPS or ceramide-treated cells may also be interpreted as indicating ER retention of the protein. This model may also be consistent with the observation that ceramide treatment blocked O-linked glycosylation of CCR5, as this post-translational modification takes place in the Golgi complex. However, this model cannot explain our observations that ceramide treatment exposed C-terminus of CCR5 to the extracellular space. This model is also inconsistent with the observation that significant amount of CCR5 in cells treated with ceramide or macrophages treated with LPS, which stimulated production of dihydroceramide, was localized on cell surface. Thus, taking all of our data together, we believe that topological inversion through RAT is the better interpretation of our results. A major implication of the current study is that membrane proteins can be regulated by topological inversion through RAT. We have previously reported that ceramide stimulates RAT of TM4SF20, and this reaction depends on the presence of a GXXXN motif in the first transmembrane helix of the protein (Chen et al., 2016). In the present study we identified ~100 proteins containing this motif in their first transmembrane helix, and demonstrated that CCR5, one of the proteins in the list, can indeed be regulated through RAT. Interestingly, most proteins in the list including CCR5 are GPCRs. In order for these proteins to function as GPCRs, the N-terminal end of the first transmembrane helix has to insert into ER lumen (Pierce et al., 2002). However, vast majority of GPCRs do not contain an N-terminal cleavable signal peptide (Guan et al., 1992), the well-characterized mechanism directing N-terminus of a protein into ER lumen (Zimmermann et al., 2011). Our finding suggests that the presence of a GXXXN motif within the first transmembrane helix of many GPCRs may be a previously unrecognized mechanism for the transmembrane helix to be inserted with such an orientation. Moreover, the presence of this motif may allow these GPCRs to be regulated through topological inversion upon accumulation of dihydroceramide, ceramide or other related sphingolipids. Such regulation not only inhibits functions of the GPCR, but also simultaneously activates functions performed by the protein with the inversed topology. Proteins sharing the architecture of GPCRs that contain seven transmembrane helices but adopting an inverted topology have been reported to function as receptors independent of G proteins (Deckert et al., 2006) and ion channels (Sato et al., 2008). Delineating functions of GPCRs with the inverted topology will greatly enhance our understanding of these receptors. An effective approach to delineate the function of CCR5 with the inverted topology is to make a mutant CCR5 that is locked into CCR5(B) regardless of the presence of ceramide or dihydroceramide. We previously reported that mutating the glycine or asparagine residue to leucine in the GXXXN motif in the first transmembrane helix of TM4SF20 locked the topology of the protein into the B form, and the mutant protein performed a function similar to that of wild type TM4SF20 with the inverted topology (TM4SF20(B)) (Chen et al., 2016). However, when we made a similar mutation in CCR5 (CCR5(N48L)), we observed that unlike wild type CCR5 with the inverted topology (CCR5(B)) that is capable of reaching cell surface, the mutant protein was exclusively localized in the ER. As a result, we are unable to rule out the possibility that the N48L substitution affects proper folding of the protein, making this model unsuitable to study the function of CCR5 with the inverted topology. Thus, delineating the molecular mechanism behind RAT may be required before reagents can be developed to determine the functions of CCR5 with the inverted topology. Transfected construct () pCCR5-Myc (human) This paper NCBI Reference Sequence: NM_000579.3 Encodes full length human CCR5 followed by five tandem repeats of the Myc epitope tag. We obtained anti-human CCR5 45531 from R and D Systems (Minneapolis, MN), anti-actin from Sigma Aldrich (St. Louis, MO), anti-Giantin 924302 from Biolegend (San Diego, CA), Alexa Fluor 488 FluoroNanogold goat anti-mouse IgG Fab from Nanoprobes.com (Yaphank, NY), AffiniPure Donkey Anti-Rabbit IgG (H + L) from Jackson ImmunoResearch (West Grove, PA), Alexa Fluor 488 goat Anti-Mouse IgG (H + L) from Invitrogen (Carlsbad, CA), Anti-SNAP-tag Antibody (Polyclonal) from New England Biolabs (Ipswichm, MA). Hybridoma cells expressing anti-Myc 9E10 were obtained from ATCC. Saponin (from quillaja bark), LPS (from Escherichia coli 0111:B4), glutaraldehyde, and fumonisin B1 (from Fusarium moniliforme) was purchased from Sigma Aldrich (St. Louis, MO). Recombinant human CCL5 was obtained from R and D Systems (Minneapolis, MN). Male and female littermates of 6–8 week-old mice of C57Bl/6 background were used for all studies under APN# 2015–100860 approved by UTSW IACUC. Wildtype mice were ordered from UTSW Breeding Core. Ccr5-/- mice (Stock: 005427) were purchased from Jackson Laboratories (Bar Harbor, ME). HEK293 (human female embryonic kidney cells) and SV589 (human male transformed fibroblasts) cells were maintained in medium A (Dulbecco’s modified Eagle’s medium with 4.5 g/l glucose, 100 U/ml penicillin, 100 μg/ml streptomycin sulfate, and 5% fetal calf serum) in monolayers at 37°C in 8% and 5% CO2, respectively. To guard against potential genomic instability, an aliquot of each cell line is passaged for only 4 weeks before a fresh batch of cells is thawed and propagated for experimental use. All the cell lines have been confirmed to be free of mycoplasma infection using the MycoAlert Mycoplasma Detection Kit (Lonza, Allendale, NJ). To obtain primary mouse macrophages, mice were intraperitoneally injected with 1 ml of 38.5 mg/ml thioglycolate. After 4 days, 3 ml phosphate buffer saline (PBS) was injected into abdomen of the mice euthanized through isoflurane overdosing. After brief massage, cells suspended in PBS were extracted and seeded in medium B (Dulbecco’s modified Eagle’s medium with 4.5 g/l glucose, 100 U/ml penicillin, 100 μg/ml streptomycin sulfate, and 10% fetal calf serum) at 37°C in 5% CO2. After 2 hr, non-macrophage cells were removed by multiple washes of medium B. Primary macrophages, which stick to the plates, were cultured medium B in monolayers at 37°C in 5% CO2. The original cDNA clone for human CCR5 was obtained from UTSW Vector Core Laboratory (IOH27324). pCCR5-Myc encodes full length human CCR5 followed by five tandem repeats of the Myc epitope tag. pSNAP-CCR5 was purchased from CisBio and encodes full length human CCR5 preceded with an N-terminal SNAP-tag. pβ2AR-SNAP, pCCR1-SNAP, pCCR4-SNAP, pCCR5-SNAP, pCCR10-SNAP and pMAS1-SNAP encode indicated full length human GPCRs followed by a C-terminal SNAP-tag. CCR5 mutants were generated through site-directed mutagenesis with the QuikChange Multi Site-Directed Mutagenesis Kit (Agilent Technologies, Santa Clara, CA) on plasmids encoding CCR5 described above. Desired mutations were confirmed by sequencing the entire open reading frame of the gene. On day 0, SV589 cells were seeded at 5 × 105 cells per 60 mm dish. On day 1, cells were transfected with 0.15 µg/dish of Myc-tagged WT or mutant CCR5 plasmid. Following treatments described in the figure legends, cells were lysed in buffer A (25 mM Tris-HCl, pH 7.2, 150 mM NaCl, 1% NP40, 0.5% Sodium Deoxycholate, 0.1% SDS) containing cOmplete Protease Inhibitor cocktail (Roche, Indianapolis, Indiana). After brief centrifugation, buffer B (62.5 mM Tri-HCl, pH6.8, 15% SDS, 8 M Urea, 10% glycerol, 100 mM DTT) was added to clarify lysate at 1:1 ratio. Cell lysate was analyzed by SDS-PAGE followed by immunoblot analysis with the indicated antibodies (1:2000 dilution for anti-Myc, 1:10,000 dilution for anti-actin). Bound antibodies were visualized with a peroxidase-conjugated secondary antibody using the SuperSignal ECL-HRP substrate system (Pierce, Waltham, Massachusetts). On day 0, HEK293 cells were seeded at 5 × 105 cells per 60 mm dish. On day 1, cells were transfected with 0.5 µg/dish of SNAP-tagged GPCRs. Following treatments described in the figure legends, for experiments shown in Figure 1B cells were treated with 5 μM cell-impermeable (SNAP-Surface 488) or cell–permeable (SNAP-Cell 505 Star) SNAP-tag substrate. For experiments shown in Figure 2D, cells were treated with 100 nM cell-impermeable substrate Lumi4-Tb (CisBio, Bedford, MA). The labeling reaction was carried out for 1 hr at 37°C in 8% CO2. Labeled cells were washed in Tag-Lite Buffer (CisBio) and resuspended to 7.5 × 105 cells/ml. Cell suspension (100 μl) were added in triplicate to a 96-well dish and fluorescence was measured using a Tecan plate reader with excitation and emission of 506 and 526 nm for SNAP-Surface 488 and SNAP-Cell 505 Star or an excitation and emission of 340 and 620 nm for Lumi4-Tb, respectively. On day 0, SV589 cells were seeded at 5 × 105 cells per 60 mm dish. On day 1, cells were transfected with 0.15 µg/dish of Myc-tagged WT or mutant CCR5 plasmid. Following treatments described in the figure legends, cell surface cysteine residues were labeled by 0.25 mg/ml EZ-link maleimide-PEG2-biotin (Thermo Fisher Scientific) and immunoprecipitated with the Pierce Cell Surface Labeling Kit according to manufacturer’s direction. Resulting fractions were mixed with buffer B at 1:1 ratio and subjected to immunoblot analysis. For immunofluorescent microscopy of transfected SV589 cells, 2 × 105 cells were seeded on each 35 mm Magtek plate on day 0. On day 1, cells were transfected with the indicated plasmids (0.1 µg/dish). After 2 hr, cells were treated with or without C6-ceramide. 16 hr later on day 2, cells were fixed in DMEM containing 4% PFA for 5 m, washed with PBS, and then incubated in the absence or presence of 0.25% saponin in PBS for 10 m as indicated. After a PBS wash and blocking with Mouse On Mouse (MOM, Vector Laboratory, Burlingame, CA) blocking buffer for 30 m, cells were incubated with 3 µg/ml 9E10 antibody or anti-Giantin (1:600 dilution) diluted in MOM Diluent buffer for 40 m. Following another wash, cells were stained with 4 µg/ml Alexa Fluor 488 goat anti-mouse IgG, 4 µg/ml Alexa Fluor 633 goat anti-rabbit IgG and 0.1 µg/ml DAPI diluted in MOM diluent buffer for 1 hr. The cells were then washed and subjected to confocal imaging analysis using the Zeiss LSM880 Airyscan microscope utilizing the Zen Digital Imaging Software. For immunofluorescent microscopy of Primary mouse macrophages, cells were set up at 1 × 106 cells per 35 mm No. 1.5 coverslip dish, and treated as described in the figure legend. Plates containing mouse primary macrophages were washed with PBS, fixed in PBS containing 1% glutaraldehyde and 4% PFA for 20 min, washed with PBS, and incubated with 50 mM glycine dissolved in PBS for 15 min to block the remaining glutaraldehyde. For cells subjected to permeabilization, the plates were treated with 0.25% saponin in PBS for 30 min. Following this step the wash was performed with either PBS (without cell permeabilization) or PBS containing 0.2% saponin (with cell permeabilization). After a wash, plates were blocked with MOM blocking buffer for 1 hr. Plates were then incubated with 1 µg/ml 45531 antibody diluted in MOM Diluent buffer overnight at 4°C. Following another wash, plates were incubated with 4 µg/ml Alexa Fluor 488 goat anti-mouse IgG and 0.1 µg/ml DAPI diluted in MOM diluent buffer for 2 hr. The plates were then washed and subjected to confocal imaging analysis using the Zeiss LSM880 Airyscan microscope utilizing the Zen Digital Imaging Software. For immuno-gold EM analysis, the plates were treated the same way as that of immunofluorescent microscopy for permeabilized cells up to the step before addition of the secondary antibody. For this purpose, the plates were incubated with 10 µg/ml Alexa Fluor 488 FluoroNanogold goat anti-mouse IgG for 2 hr. The plates were then washed with PBS containing 50 mM glycine, and submitted to the UTSW EM Core for gold enhancement, sectioning, and sample preparation. Imaging was performed on a Tecnai Spirit electron microscopy utilizing the iTEM software and a Morada camera. Primary mouse macrophages from mice were seeded into upper wells of transwell plates at 2 × 105 cells per well, and treated as described in the figure legend. Migration assays were performed with the CytoSelect 96-Well Cell Migration Assay (Cell Biolabs, Inc., San Diego, CA) using Corning HTS Transwell 96 well permeable supports (Sigma-Aldrich, St. Louis, MO) according manufacturer’s direction. Signals generated in the absence of CCL5 were subtracted to normalize for random migration. Pattern Hit Initiated BLAST was performed using the first transmembrane domain of TM4SF20 as the query sequence combined with the following PHI-BLAST algorithm: [LVAWPMIF](2-8)GXXXN[LVAWPMIF](5-7). Resulting proteins confirmed to have the GXXXN motif within the first transmembrane domain were included to run three additional rounds of Position-Specific Iterative BLAST. All proteins reported in Table 1—source data 1 were checked manually to confirm that they contain the GXXXN motif in the first transmembrane helix. Methods of quantification and statistical analysis are reported in the Figure Legends. The Journal of Experimental Medicine 194:1661–1674. Journal of Clinical Investigation 88:540–545. Journal of Receptors and Signal Transduction 26:647–657. Journal of Biological Chemistry 287:15076–15086. Journal of Molecular Biology 365:1063–1075. Immunology and Cell Biology 93:825–836. The Journal of Biological Chemistry 267:21995–21998. Journal of Biological Chemistry 271:24625–24633. Cytokine & Growth Factor Reviews 12:313–335. Journal of Biological Chemistry 274:9617–9626. Molecular Biology of the Cell 4:679–693. Journal of Immunological Methods 433:51–58. Journal of Biological Chemistry 272:24934–24941. Journal of Biological Chemistry 290:15371–15379. Journal of Biological Chemistry 285:38568–38579. Biochimica Et Biophysica Acta (BBA) - Biomembranes 1808:912–924. We reiterate that there is potential to test your hypothesis further for chemokine receptors CXCR1 (SLLGN) and CXCR2 (SLLGN), which have a first helix lacking the GXXXN motif, and which are more similar b2 adrenergic receptor (IVFGN), which did not display the signatures of inversion. It would be very interesting to learn if these receptors would continue to function after strong LPS signaling, suggesting that cells expressing these receptors (including neutrophils) might still respond to endogenous chemokines in the context of bacterial sepsis. 1) In response to my original point (3), the authors have simply removed all data regarding the G44L and N48L mutants because they could not be used to support their model. This substantially weakens the paper in two ways (and calls into question their interpretation of analogous mutants analyzed in their earlier paper). First, the notion that this motif is a key determinant of RAT simply cannot be supported because there are now no data provided in the manuscript to probe this. Second, they now have no experiments that actually perturb RAT by manipulating translocation to convince a reader that the effects can indeed be traced to altered protein topogenesis. 2) The authors' response to my original point (4) is not consistent with a rather large body of data on how protein translocation works. I had pointed out that if their SNAP-CCR5 construct contains a signal peptide at the N-terminus, the signal would enforce translocation of the N-terminus into the lumen thereby ensuring the canonical CCR5 topology. The authors countered that the downstream TMD "prevails over...the signal peptide". This might be feasible if the sequence between the signal and TMD was relatively short and unstructured; however, the SNAP tag is neither short (being ~185 amino acids long) nor unstructured. Because topogenesis occur co-translationally (very well established), the signal peptide will initiate translocation long before the TMD is even synthesized (also very well established). By the time the TMD emerges from the ribosome, the entire SNAP tag (~20 kD) will be in the lumen. It is exceedingly unlikely that the TMD can 'override' this situation and somehow cause the lumenal SNAP tag to be retrieved to the cytosol. If this is indeed the claim, the available data is simply too weak to overturn (or ignore) the considerable literature on this issue. For this reason, I feel the authors are almost certainly wrong in their interpretation. Because they nonetheless see RAT by their assay, I would strongly suspect a flaw in their assay rather than ignoring well-established principles of how signal peptides and protein translocation work. 3) The authors' response to point (6) actually argues against them. I had pointed out that immunogold EM labeling has a spatial precision of at best 20-30 nm, which would pose a challenge for determining whether an epitope was on one or the other side of a 5 nm thick membrane. I also noted that some of their gold clusters were ~200 nm away from the plasma membrane, making me think they were observing intracellular antigens in these cases. The authors countered that they felt an antibody sandwich could indeed reach 200 nm away (how is unclear given the known dimensions of an antibody). Regardless, if one does believe the precision is 200 nm, it is an even worse technique for determining topology where 5 nm resolution is needed. The authors cite earlier studies using immunogold EM for topology, but previous ill-advised uses of a method is not a strong argument for using it again now. 1) The fluorescence micrographs remain of poor resolution and one cannot judge in most cases whether the staining actually represents surface localization as claimed (e.g., Figure 1 and Figure 2–figure supplement 1). 2) The authors claim that gold clusters are sometimes almost 200 nm away from the surface on the extracellular side as well. However, in each instance shown in the paper, these clusters seem to have membrane patches under them. The authors have added some sentences to the discussion and modified Figure 6 (summary) but in the end really did not address the questions I asked. The manuscript suggests that chemokine receptors could be regulated by inversion. If that were the case than as a cell is migrating at some point more inversion would occur to allow it to stop at its destination. Adding LPS to the system simply complicates the model and may represent a hijacking of the inversion by bacterial products. It would be nice to know whether inversion ever blocks a chemotaxing cell without having to invoke LPS. In figure 5B there is some suggestion this may be the case as fewer cells are migrating when FB1 is added to chemotaxing cells (about 35% inhibition). My point is that the paper as it stands is not really about chemotaxis but about how LPS might block chemotaxis. It’s really the pathology of a system for which the physiology has not been worked out. Does inversion play a role under normal chemotaxis to stop cells? I think this would be important for this paper. My comment is the same as in my first review. What is the physiologic importance of inversion of a chemokine receptor? Thank you for submitting your article "Regulating G Protein-Coupled Receptors by Topological Inversion" for consideration by eLife. Your article has been reviewed by three peer reviewers, including Michael L Dustin as the Reviewing Editor and Reviewer #1, and the evaluation has been overseen by Richard Aldrich as the Senior Editor. The other two reviewers remain anonymous. Currently there are some major issues to resolve. This assessment is based on the reviews and our subsequent discussion in which the reviewers could see each other comments. Reviewer 1 (MLD) and 3 were largely accepting of the cell biology, but had questions about the biological implications. Reviewer 2 has a number of technical issues regarding the demonstration of inversion of the chemokine receptor rather than other mechanisms, such as ER retention. To provide a little more context, reviewer 1 considered points 2 and 6 of reviewer 2 at length and decided that your interpretation was consistent with the data. But reviewer 2 makes other points that would leave major issues unresolved with the paper in its current form. The work is technically sound and I have no concerns with the major conclusions regarding the time frame of topological inversion and the loss of sensitivity to CCR5 ligands. Prior work has demonstrated a rapid p38, and recently, arrestin dependent suppression of responses to classical chemokine and leukotriene binding GPCR by receptor for chemoattractants that more directly identify the location of pathogens like the fMLP receptor or C5a receptor. This hierarchy is thought to help direct leukocytes into tissues through the chemokine and leukotriene receptors and then allow local prioritisation of signals that best allow phagocytes to target microbes. The mechanism discovered here develops over several hours, but seems to eliminate function of most of the CC and CXC chemokine receptors (except CXCR1 and CXCR2 by sequence) and the microbe associated fMLP and C5a receptors, which also have the GXXXN motif in helix 1 and may be blinded by this mechanism. As reagents may be available to more broadly investigate inversion of GXXXN vs non-GXXXN GPCR expressed by phagocytes in response to LPS could shed light on the extent to which the sequence is actually predictive of this phenomenon. The authors have raised the issue by drawing in their interpretive drawing that this mechanism also allows phagocytes to locate microbes, but based on the sequence information, this doesn't seem to be the case and the LPS treated phagocytes will also be blinded to microbes after about 16 hours. This would give this mechanism a broader impact on leukocyte chemotaxis than the previously defined hierarchies. This would seem to have implications for challenges with clearing extracellular microbes in sepsis. 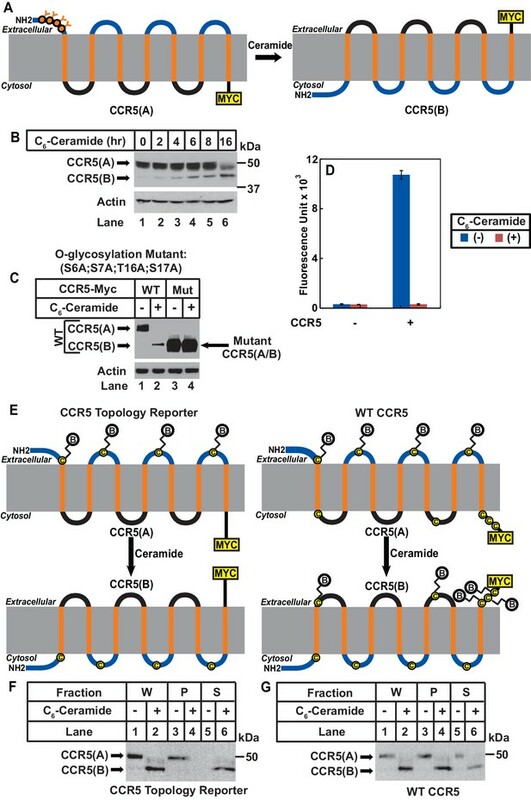 This manuscript arrives at the remarkable conclusion that CCR5 (and certain other GPCRs) can be made in a fully inverted topology in response to altered ceramide levels. The functional consequence of this inversion is the reduced biological activity of the receptor, which in the case of CCR5 involves macrophage migration toward its ligand, CCL5. Due to the striking nature of these claims, we read the manuscript with great interest. While there is no doubt that ceramide affects CCR5 in some manner, numerous conceptual and experimental flaws in the study's design and interpretation greatly weaken the argument that the basis of these effects is topology inversion. When the below points are considered together, it would seem that much of the data argue for ceramide affecting CCR5 trafficking, not topology. I would therefore strongly encourage the authors to reconsider publication of this study until the data for an effect on topogenesis is examined more carefully and thoroughly. Indeed, it is noteworthy (and rather surprising) that not a single experiment in the paper actually looks at CCR5 topogenesis at the ER, opting instead for relatively blunt end-point assays prone to alternative interpretations as outlined below. 1) The assays in which the C-terminus of CCR5 is tagged and monitored by cell impermeable labelling are only sufficient to qualitatively demonstrate the topological location of the tagged terminus, but cannot accurately report on CCR5 topogenesis as a whole. It is easily conceivable that drastic changes in lipid composition within the cell result in misfolding or incomplete insertion of some TMDs such that the C-terminus winds up in the ER lumen at some low level. Given that these are all performed with an overexpressed protein, it is also conceivable that a misfolded population would "escape" the quality control machinery and successfully reach the PM. For these reasons, it is important to carefully quantify the amount of surface-exposed 'inverted' CCR5 relative to total cellular CCR5. One way to do this would be to use biotin-SNAP to label the surface exposed inverted CCR5, then use avidin pulldowns and blots to determine what proportion of total cellular CCR5 was surface labeled. Controls using pre-labeling with fluorescent SNAP label prior to biotin labeling could verify that labeling efficiencies are close to quantitative. Such an experiment would also verify that what is being detected is actually full length CCR5, not a fragment. 2) In several of the critical experiments aimed at demonstrating topology inversion, the authors use glycosylation as an assay for topology. While N-linked glycosylation is a reasonable proxy for topology, O-linked glycosyation is problematic. The reason is that this reaction occurs in the Golgi on the folded protein. Thus, the absence of O-linked glycosylation could be due to a failure of the protein to reach the Golgi and/or altered folding, and not necessarily indicative of topology. Furthermore, I did not see where the authors provided evidence that O-linked glycosylation is not impacted by 16 h of ceramide treatment. This would seem to be a critical control for any assay relying on an endogenous biochemical reaction. 3) G44L and N48L are used as mutants intended to confine topogenesis to the inverted form. However, these mutants are problematic for three reasons. First, inspection of the crystal structure of CCR5 reveals that they both face the interior of the folded protein, with N48 interacting with D76, and the absence of a side chain on G44 being important for avoiding clashes with L80. Thus, mutating either residue to Leucine will very likely disrupt the folding of the protein, and hence might cause it to be primarily retained in the ER. This would readily explain why it is not O-glycosylated by Golgi enzymes (Figure 2B) and why none of it is labelled at the surface in Figure 2E without having to invoke an inverted topology. Second, the non-conservative mutations that substantially increase hydrophobicity is ill-advised as it may have effects on topology independently of the GXXXN motif. Instead, mutating this motif to residues of comparable hydrophobicity is preferable to more cleanly illustrate that N is crucial to ceramine-induced effects. Even this may well be confounded by effects on protein structure/stability. Third, the increased hydrophobicity of the G44L or N48L mutations is actually predicted to favour the correct orientation with the N-terminus facing the extracellular side (see PMID 9151664), not the inverted orientation as proposed by the authors. For all of these reasons, it is quite unlikely that mutants are acting in the way the authors propose. 4) The SNAP-CCR5 construct used in Figure 2E and Figure 2—figure supplement 2 would seem to directly disprove the authors' conclusions. As stated in the main text, the construct contains a SNAP tag (~20 kD) at the N-terminus, and according to the Materials and methods, this was obtained from CisBio. The sequence of the construct from CisBio indicates that the construct contains the N-terminal signal sequence from human CD8. This would explain how the SNAP tag domain actually gets translocated across the ER membrane. Thus, the topology of this construct is determined by the N-terminal signal sequence, not the first transmembrane domain as in the untagged construct. Rather remarkably, the SNAP-CCR5 also shows strong ceramide-induced exposure at the cell surface (Figure 2E) and loss of O-linked glycosylation (supplement). Since this construct's topology is not determined by the first transmembrane domain, it would seem that both the surface exposure and glycosylation are affected by ceramide for other reasons. The simplest interpretation is retention of the protein in the ER after ceramide treatment, which would also explain why the N48L is constitutively not only the surface and why it is constitutively not glycosylated. The authors seems to have completely overlooked the fact that this construct has a signal sequence. If they have removed it, then it is not stated in the Materials and methods (and it would be very hard to explain how the N-terminus could be translocated across the ER membrane). 5) The cysteine mutations intended to be a reporter of topology are problematic because several cysteines on the cytosolic side of CCR5 are palmitoylated. Thus, mutating these may well have consequences for trafficking of the receptor (see PMID 21819967 for a review), confounding any interpretations from this approach. 6) The authors use immunogold labelling to infer topology of CCR5 in macrophages (Figure 3J-3L). This is conceptually problematic and the observations do not seem to fit with their favoured interpretation. Given that their primary antibody recognizes an epitope close to the membrane and the secondary antibody appears to be a gold-conjugated Fab (not entirely clear in the Materials and methods), the label can be up to ~21 nm away from the epitope (~14 nm for an IgG, and ~7 nm for the Fab). This distance increases to ~28-30 nm if the secondary antibody is a whole IgG. In either case, the label can easily be on either side of the membrane regardless of the topology because the membrane thickness is only ~5 nm. Hence, without extensive numbers and statistical power, one simply cannot get the 5 nm resolution needed to infer topology using a labelling method with a precision of 20-30 nm. Remarkably however, they do see a difference. But inspection of the micrograph in Figure 3K shows that the gold particles are ~200 nm or more away from the plasma membrane. As should be obvious from the above considerations, this cannot be compatible with labelling of a cell surface protein. Many of the examples in the supplement are also too far away (although a scale bar was not provided). Thus, the simplest explanation is that after LPS treatment, the CCR5 that is labelled is in intracellular compartments, perhaps the ER (which is often close to the plasma membrane). However, the membrane morphology is not retained very well in their EM images, so one cannot really evaluate this. A second major issue is that they only observe an average of ~1.3 labels per cell. It is difficult to know what to make of this given how much signal is seen in the fluorescent images using the same antibody. For these reasons, the authors' interpretation of the immuno-EM cannot be supported from the data they present. 7) In the absence of the immuno-EM experiment, the macrophage data is very weak in establishing any role for topology inversion of CCR5 in LPS-stimulated macrophage migration. Figure 3A to 3I simply establishes that LPS reduces surface levels of CCR5 and does not speak at all to its topology. The same is true for Figure 4. All of these data are equally consistent with LPS causing intracellular retention (or endocytosis) of CCR5 in a dihydroceramide dependent manner. Thus, the effects on migration seen in Figure 5 simply reflects the fact that there is less CCR5 on the surface of these macrophages. 1) The fluorescence microscopy is poor resolution and often over-exposed (at least in the images I was provided) so it is very hard to judge localization (surface versus intracellular locations). 2) Introduction – the authors state that "it remains unclear how GPCRs can adopt such a membrane topology without the signal peptide." This is not accurate, as the study of how an N-terminal transmembrane domain directs topology has been extensively studied. Such sequences are termed signal anchors because they act as both a signal sequence and transmembrane anchor. The features that determine their topology has been investigated by extensive mutagenesis many years ago (see PMID 15461443 for a review, and PMIDs 9151664, 8557050, and 1985975 for some of the primary papers), and quite a bit has also been done on the molecular basis of their insertion (see PMID 10943843). 3) Throughout the paper, the authors essentially assume that an inverted GPCR would traffic to the cell surface. This seems very unlikely because the extracellular domain facing the cytosol would not form disulphide bonds and therefore not fold correctly, while the C-terminus facing the outside would not be palmitoylated. A more nuanced discussion is merited. 4) The surface labelling kit cited in the Materials and methods labels amines, not sulfhydryls. Some clarification is needed here about how the experiment was actually done. This study proposes a very nice mechanism of chemokine receptor inversion to explain why cells may stop chemotaxing. While interesting, the biological situation chosen is a difficult one to understand i.e., LPS stimulation of peritoneal macrophages prevents migration to CCL5. I will ask a few questions that would need to be answered with additional experiments. There is much work to demonstrate that when high enough concentrations of a chemokine for sufficient time leads to downregulation of the receptor or the receptor becomes non-responsive. While to date inversion has not been proposed, it would be important to see whether inversion is important under these conditions to cause desensitization of the chemokine receptor. In other words is inversion responsible for desensitization. There is much data to suggest that a very different mechanism (β-arrestin) is responsible and this needs to be addressed. As this work may be very important for chemotaxis field. LPS can stimulate integrin activation leading to a stop signal for immune cells mediated through TLR4. While the authors argue that there is chemokine receptor inversion, there may be a modifying role for integrins and other effectors (Ca levels etc). As such the LPS experiments becomes very hard to interpret. There is a growing view that chemokines function in a hierarchical model with some being turned off while others become activated. It would be good to consider this potential reason for inversion. While this is very exciting cell biology, I fail to understand how this contributes to a bigger picture of the immune response. The authors in the first paragraph of discussion suggest that this is critical for a good immune response, however an alternative interpretation could be that LPS subverts the immune response and does not allow immune cells to come to the nidus of infection. Without experiments to see whether the inversion is better or worse for infection outcome, the discussion is purely speculative. The experiments are performed with a high level of sophistication. It was not clear to us from the last round of review that determining whether CXCR1 and CXCR2 are subjected to RAT was a major concern of Reviewer #1. We would like to emphasize that unlike posttranslational modifications of proteins such as phosphorylation, topological regulation of a transmembrane protein cannot be determined by a single assay. It took us more than two years to gather all the evidences supporting RAT of CCR5. It will take at least as long to determine whether two other proteins are subject to RAT. While we appreciate and share the curiosity of the reviewer, the requested studies for sure cannot be accomplished within the timeframe of revision of the manuscript. We disagree with the reviewer on this point. In addition to altering the direction through which the nascent polypeptide of a transmembrane protein is translocated across membranes during its synthesis, mutations made in the GXXXN motif could also affect folding of the protein after its synthesis is completed. This appears to be the case for CCR5. Unlike wild type CCR5 with the inverted topology produced in cells treated with ceramide or LPS that reached plasma membranes, the mutant CCR5 in which the GXXXN motif was disrupted was retained in the ER. As pointed out by the reviewer during the last round of review, the ER retention of the mutant proteins made it hard to interpret the results of some assays used to measure topology of CCR5. While we are disappointed that we may not be able to use the mutant protein as a tool to study RAT of CCR5, this limitation does not prevent us from drawing the conclusion that ceramide inverts the topology of wild type CCR5. Unlike CCR5, we were able to demonstrate the critical importance of the GXXXN motif in ceramide-induced RAT of TM4SF20, because the G22L and N26L mutations disrupting the GXXXN motif only affected translocation but not folding and functions of the protein after its synthesis. This conclusion is supported by our observations that these mutants adopt the inverted topology regardless of ceramide treatment, and is active in stimulating cleavage of CREB3L1, the same function performed by wild type TM4SF20 with the inverted topology produced in cells treated with ceramide. We are thus curious how the reviewer reached the conclusion that the current study “calls into question their interpretation of analogous mutants analyzed in their earlier paper”. We agree with the reviewer that our data cannot be explained by the established model on protein translocation. However, we have to point out that the current model is established through in vitro translation of model substrates the translocation of which is constitutive and dependent on Sec61. While this model is the important first step toward understanding protein translocation, it by no means explains translocation process of all transmembrane proteins. Neither does this model explain how translocation of certain transmembrane proteins is inverted by ceramide. Along this line, we would like to point out a recent discovery showing that the first transmembrane helix of certain GPCRs is translocated through the EMC complex but not Sec61. These new discoveries suggest that there are other unknown mechanisms governing protein translocation. We would like to assure the reviewer that delineating the underlying translocation mechanism of RAT is a top priority in our lab. We hope that our new studies may expand the current model on protein translocation to address the concern of the reviewer. We still do not understand this criticism of the reviewer. After fixation, proteins should be fixed into their position so there should be no movement of the protein across plasma membranes during EM analysis. We thus do not understand why a 5-nm resolution is required to determine whether the epitope is extracellular or cytosolic. According to this critic, one could never determine whether the nucleus of a cell is intracellular or extracellular through EM, as its distance toward plasma membranes is much greater than 200 nm. For immunofluorescent microscopy performed in the absence of cell permeablization, the fluorescent signal can only be detected if the epitope fused at the C-terminus of CCR5 is extracellular. When the same experiment is performed in permeabilized cells, in addition to the cell surface staining, intracellular staining of the epitope-tagged CCR5 should also be present because of the overexpression. We are not sure the hazy signals surrounding the gold cluster are membrane patches. In this study, we never suggest that topological inversion of CCR5 is responsible for its chemokine ligand such as CCL5 to inactivate CCR5. This is because only LPS but not CCL5 was demonstrated to induce synthesis of dihydroceramide in macrophages. We are pleased that the reviewer agreed that our study demonstrated how LPS might block chemotaxis. However, we do not understand why the reviewer considered only chemokine but not LPS-induced inactivation of CCR5 as physiologically important, as LPS-induced inhibition of macrophage chemotaxis contributes to development of sepsis. As pointed out in Discussion of the manuscript, we realized that CCR5 can be desensitized by its ligand through arrestin-mediated internalization. Thus, even if we demonstrate that CCL5 inverts the topology of CCR5, we have to address which pathway contributes more to inactivate CCR5. To answer this question, we have to make a mutant CCR5 resisting dihydroceramide-induced RAT by locking the topology into CCR5(A). Unfortunately, so far we are unable to find such a mutant. Thus, understanding the molecular details of the regulatory mechanism behind RAT may be required before reagents can be developed to test this hypothesis. Obviously, the study suggested by the reviewer cannot be accomplished within the timeframe of revision of the manuscript. […] The authors have raised the issue by drawing in their interpretive drawing that this mechanism also allows phagocytes to locate microbes, but based on the sequence information, this doesn't seem to be the case and the LPS treated phagocytes will also be blinded to microbes after about 16 hours. This would give this mechanism a broader impact on leukocyte chemotaxis than the previously defined hierarchies. This would seem to have implications for challenges with clearing extracellular microbes in sepsis. We would like to thank the reviewer for his positive comments. We agree with the reviewer that our model shown in Figure 6 of the original manuscript could be misleading. We mean to show that after contacting LPS, macrophages stop migrating further toward chemokines so they can combat bacterial infection at the current location through mechanism such as secreting proinflammatory cytokines but not necessarily through enhanced phagocytosis of bacteria. In the revised manuscript, we redraw the figure to remove any implication of phagocytosis of bacteria by macrophages. We also clarify that point, and emphasize that RAT of the chemokine receptors may be responsible for impaired clearance of bacterial infection during sepsis when we discuss the figure in the first paragraph of the Discussion section. An experiment very similar to that proposed by the reviewer was shown in Figure 2H of the original manuscript (Figure 2G of the revised manuscript). The result shows that majority of full length CCR5(B) produced in ceramide-treated cells can be labeled by a thiol-reactive cell surface biotin labeling reaction thereby precipitable by streptavidin beads. These results support the hypothesis that CCR5 produced in ceramide-treated cells is also localized on plasma membranes. 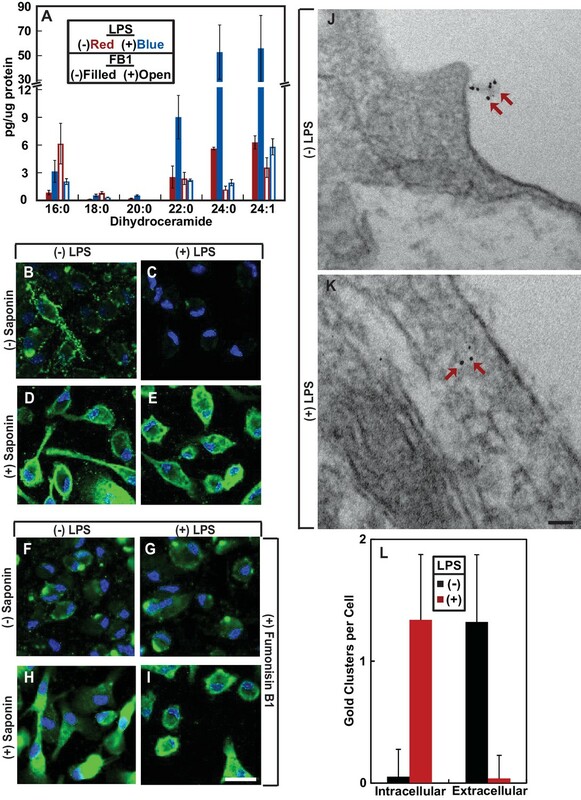 The data shown in Figure 2H of the original manuscript (Figure 2G of the revised manuscript) clearly demonstrated that the unglycosylated CCR5 produced in ceramide-treated cells reached cell surface. This observation is inconsistent with the interpretation that the lack of the glycosylation is caused by retention of the protein in the ER. Unlike N-linked glycosylation, the carbohydrate attachment to proteins through O-linked glycosylation is different among individual protein. Even for the same protein, the O-linked glycosylation reaction could be different when the protein is expressed in a different cell. The extreme heterogeneity of this reaction makes it impossible to perform a control experiment to determine the effect of ceramide on O-linked glycosylation in general. Unlike wild type CCR5, we did not perform experiments to carefully examine the localization of CCR5(N48L) in the original manuscript. Following the analogy with TM4SF20, we assumed that the mutant protein is locked into the inversed topology, as the apparent molecular weight of the mutant protein is identical to unglycosylated CCR5(B) regardless of ceramide treatment. After reading the comments of the reviewer, we performed a cell surface biotin labeling experiment similar to that shown in Figure 2G to determine the localization of the mutant protein. Unlike the results obtained from wild type CCR5, we were surprised to find out that the mutant protein barely reached cell surface regardless of ceramide treatment. This observation and results from immunofluorescent microscopy suggest that CCR5(N48L) is primarily localized in the ER. Thus, the reviewer is correct in that the data showing the lack of the O-linked glycosylation and the absence of the N-terminal SNAP labeling of the mutant protein may not be used to support our hypothesis. As a result, we remove all data using the mutant CCR5 from the original manuscript, and discuss our new finding regarding the mutant CCR5 in paragraph six of the Discussion in the revised manuscript. We thank the reviewer for pointing out this important problem in our original manuscript. However, we would like to emphasize that removing these data does not alter our conclusion regarding ceramide-induced topological inversion of wild type CCR5, because both CCR5(A) produced in the absence of ceramide and CCR5(B) generated in ceramide-treated cells reach the cell surface. The reviewer assumes that addition of an N-terminal signal peptide will override the RAT signal generated by the GXXXN motif present in the first transmembrane helix. We actually had the same hypothesis when we studied RAT of TM4SF20. Astonishingly, the translocation signal generated by the GXXXN motif in the first transmembrane domain prevails over that produced by the signal peptide, as fusing a prolactin signal peptide at the N-terminus of TM4SF20 did not affect ceramide-induced RAT of TM4SF20 (Chen et al., 2016, cited in the manuscript). Thus, we are not surprised at the finding that the presence of a signal peptide at the N-terminus of SNAP-CCR5 does not affect RAT of the fusion protein. This is one of the reasons why we are unable to make a mutant CCR5 or TM4SF20 that is locked in the A form, resisting ceramide-induced topological inversion. We make this point clearer when we present the data shown in Figure 2D in paragraph five of the Results section of the revised manuscript. This point is also discussed in paragraph three of the Discussion section of the revised manuscript. The result shown in Figure 2G of the original manuscript (Figure 2F of the revised manuscript) clearly demonstrates that CCR5(A) with all cysteines at the cytosolic side mutated still reached cell surface in the absence of ceramide treatment. This observation should address the concern of the reviewer. 6) The authors use immunogold labelling to infer topology of CCR5 in macrophages (Figure 3J-3L). This is conceptually problematic and the observations do not seem to fit with their favoured interpretation. Given that their primary antibody recognizes an epitope close to the membrane and the secondary antibody appears to be a gold-conjugated Fab (not entirely clear in the Materials and methods), the label can be up to ~21 nm away from the epitope (~14 nm for an IgG, and ~7 nm for the Fab). This distance increases to ~28-30 nm if the secondary antibody is a whole IgG. In either case, the label can easily be on either side of the membrane regardless of the topology because the membrane thickness is only ~5 nm. Hence, without extensive numbers and statistical power, one simply cannot get the 5 nm resolution needed to infer topology using a labelling method with a precision of 20-30 nm. Did the reviewer suggest that immunogold EM is not suitable to determine whether an epitope is at the intracellular or extracellular side of plasma membranes? Using immunogold EM, a previous study (Singer et al., 2001, cited in the manuscript) clearly showed that the N-terminal domain of CCR5 is exclusively localized at the extracellular side of plasma membranes in cells under resting state. They did not observe any intracellular staining. This technique has been frequently used to determine the topology of transmembrane proteins localized on plasma membranes (For example, PMID: 26797119). Remarkably however, they do see a difference. But inspection of the micrograph in Figure 3K shows that the gold particles are ~200 nm or more away from the plasma membrane. As should be obvious from the above considerations, this cannot be compatible with labelling of a cell surface protein. Many of the examples in the supplement are also too far away (although a scale bar was not provided). Thus, the simplest explanation is that after LPS treatment, the CCR5 that is labelled is in intracellular compartments, perhaps the ER (which is often close to the plasma membrane). However, the membrane morphology is not retained very well in their EM images, so one cannot really evaluate this. The CCR5-specific gold cluster signal is caused by binding of multiple gold-conjugated secondary antibodies to anti-CCR5. As a result, the distance between these signals and plasma membranes are longer than that calculated by the reviewer. This pattern of CCR5 staining was also observed in an earlier study (Singer et al., 2001, cited in the manuscript). Consistent with this explanation, we observed that the distance between extracellular CCR5 signal and plasma membranes in resting cells is not too much different from that between intracellular CCR5 signal and plasma membranes in LPS-treated cells. We also added the scale bar in images shown in Figure 3—figure supplement 3 of the revised manuscript. The scale bar was somehow lost when we converted our figure into PDF format during last submission. A second major issue is that they only observe an average of ~1.3 labels per cell. It is difficult to know what to make of this given how much signal is seen in the fluorescent images using the same antibody. For these reasons, the authors' interpretation of the immuno-EM cannot be supported from the data they present. As stated in the manuscript, we observed both gold cluster and single gold particle-labeled signal in the EM images. Only the gold cluster signal is considered as CCR5-specific as such signal was never observed in CCR5-/- macrophages. Some CCR5 was labeled by a single gold particle, as their number in wild type macrophages was higher than that in CCR5-/- macrophages. However, the specificity of such labeling was difficult to determine, as these particles did exist in CCR5-/- macrophages. As a result, we only counted the gold cluster signal. This number should be smaller than that of CCR5 molecules, as it did not include CCR5 labeled by a single gold particle. We make this point clearer when we discuss these results in paragraph ten of the Results section of the revised manuscript. As stated in our comments above, we believe that our immuno-EM data do provide a critical piece of evidence to support out hypothesis. In addition, our immunofluorescent microscopy results shown in Figures 3D and E suggest that CCR5 was localized on plasma membranes regardless of LPS treatment. Thus, our data about endogenous CCR5 expressed in macrophages are consistent with our model that LPS-induced dihydroceramide production triggers RAT of CCR5. The immunofluorescent signals generated in non-permeabilized cells were much weaker than that produced in permeabilized cells. Since the exposure was kept at the same level for all images, we had to overexpose the images of the permeabilized cells in order to see a clear signal of non-permeabilized cells. In the revised manuscript, we include immunofluorescent microscopy results of the permeabilized cells with normal intensity in Figure 3—figure supplement 2. These results show that CCR5 in macrophages is primarily localized on plasma membranes regardless of LPS treatment. We rewrite this part of Introduction in the first paragraph of the revised manuscript to incorporate this information. We do not ASSUME that GPCR with the inverted topology reaches cell surface. This conclusion is directly supported by the data shown in Figure 1 and Figure 2G of the revised manuscript. However, we agree with the reviewer that a better discussion is needed to clarify this point. We now show in paragraph four of the Discussion section that our data regarding inaccessibility of the antibodies against extracellular regions of CCR5(A) with the GPCR configuration in ceramide-treated cells may be interpreted by ER retention of the protein. This model may also be consistent with the observation that ceramide treatment blocked O-linked glycosylation of CCR5, as this post-translational modification takes place in the Golgi complex. However, this model cannot explain our observations that ceramide treatment exposed C-terminus of CCR5 to the extracellular space. Nor is this model consistent with the observation that significant amount of CCR5 in cells treated with ceramide or macrophages treated with LPS, which stimulated production of dihydroceramide, was localized on cell surface. Thus, taking all of our data together, we believe that topological inversion through RAT is the better interpretation of our results. We thank the reviewer for pointing out this important mistake we made in the original manuscript. We actually labeled cell surface cysteine residues with 0.25 mg/ml EZ-link maleimide-PEG2-biotin (Thermo Fisher Scientific) and then immunoprecipitated the labeled proteins with the Pierce Cell Surface Labeling Kit. We correct this mistake in the section of Materials and methods. The current study suggests that LPS-induced topological inversion of CCR5 may be one of the mechanisms for LPS to inhibit chemotaxis mediated by the receptor. This conclusion is supported by our observations that FB1, which blocked LPS-induced topological inversion of CCR5 by inhibiting synthesis of dihydroceramide, restored the chemotaxis reaction of macrophages exposed to LPS. However, we agree with the reviewer that the evidence we provided is not sufficient to demonstrate that topological inversion of CCR5 is the primary mechanism for LPS to desensitize CCR5, as dihydroceramide may activate the arrestin and/or integrin pathway mentioned by the reviewer, or any unknown pathways that inactivate CCR5. The only way to address the question of the reviewer is to make a mutant CCR5 resisting dihydroceramide-induced RAT by locking its topology into the GPCR configuration (CCR5(A)). Unfortunately, fixing topology of CCR5 and TM4SF20, another protein subjected to RAT, into their A form appears to be challenging. Just adding a signal peptide at the N-terminus of these proteins does not block ceramide/dihydroceramide-induced topological inversion. Thus, understanding the molecular details of the regulatory mechanism behind RAT may be required before reagents can be developed to address the question raised by the reviewer. This point is now discussed in paragraph three of the Discussion section. We would like to reassure the reviewer that we are vigorously pursuing study to address this question, but owing to the lack of the key reagent, we are unable to include these studies into the current manuscript. We agree with the reviewer that our model shown in Figure 6 is speculative at this time. We have revised our discussion in the first paragraph of the Discussion in the revised manuscript to demonstrate this point. As suggested by the reviewer, we also discuss in this paragraph the potential contribution of this mechanism to inhibit macrophage migration during sepsis. We thank Joachim Seemann, Drs. Brown and Goldstein for their helpful comments and constant support; Lisa Beatty, Ijeoma Dukes, Nimisha Jacob and Lauren Valsin for help with tissue culture; Elina Esmaeilzadeh for technical assistance; and Nancy Heard and Chelsea Burroughs for graphic illustration. We acknowledge UTSW EM Core, Live Cell Imaging Core, and Metabolic Phenotyping Core for their technical support. This work was supported by grants from the National Institutes of Health (GM-116106 and HL-20948) and Welch Foundation (I-1832). Animal experimentation: Male and female littermates of 6-8 week-old mice of C57Bl/6 background were used for all studies under APN# 2015-100860 approved by UTSW IACUC. © 2019, Denard et al.